This rug suits my purpose to a tee. It isn't as heavy as some other rugs I have looked at. But they were double the price. I am very happy! 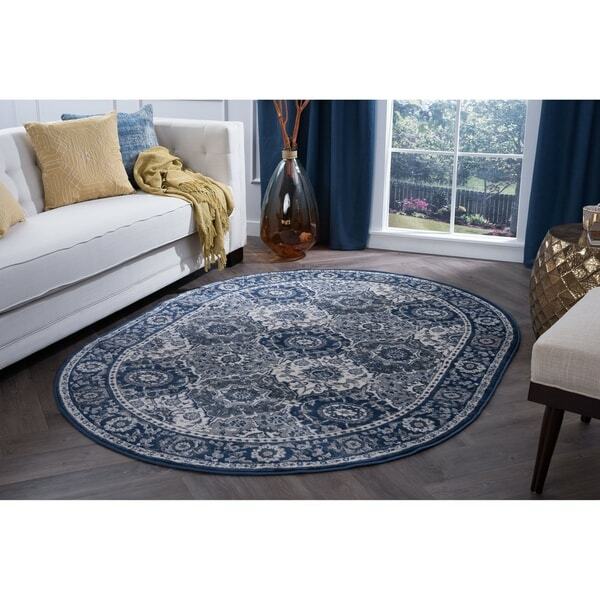 Beauty and versatility know no bounds with this rug, featuring a historically elegant oriental pattern to liven up any living space with culture and definition. This rug stands the test of time with expertly crafted durable materials such as stain-resistant Polypropylene fibers, along with a natural Jute backing for maximum support and comfort. Vacuum on high pile setting; spot clean with mild detergent and water when necessary. Do not bleach. Exact Rug Size: 5'3'' x 7'3'' Oval / 87 in. x 63 in. Dimensions 87.0 In. X 63.0 In. X 0.35 In.